Extensive digital guided lesson for People of Georgia and self-grading assessment. Aligned to the people listed in the GSE for SS8 Historical Understandings. 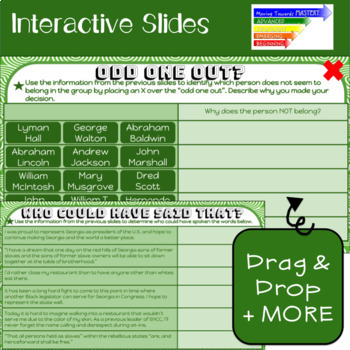 50 student slides are included along with a teacher's guide and answer key. Ready for an end of year review? 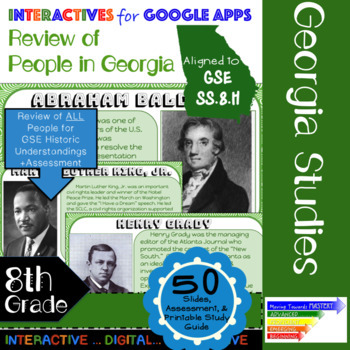 Students will read and highlight information about the people of Georgia. They will then answer questions and drag & drop tiles using the information gathered. Ready to assess? Using Google Forms is a quick way to evaluate students' level of mastery. Students receive immediate feedback after submitting their Google Form by clicking on “View Score.” Google Forms can be used with or without Google Classroom. 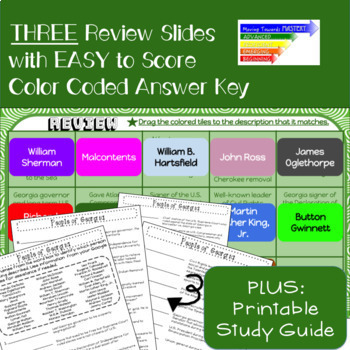 ♦ Martin Luther King, Jr.
♦ Highlight overall descriptions, time periods, and values and beliefs for each person or people group according to a color code. → Who Could Have Said That? New to Google Apps? A step by step teacher's guide is provided. ★ Follow Me to be notified of NEWLY released Google Interactives. By purchasing this product, you own a license for one teacher only for personal use in their own classroom. Licenses are non-transferable, unless you have purchased a transferable license, and therefore can not be passed from one teacher to another. If the teacher who purchased this license leaves the classroom or changes schools, the license and materials leave with that teacher. No part of this resource is to be shared with colleagues or used by an entire team, grade level, school or district without purchasing the correct number of licenses. Please note - all material included in this resource belongs to Moving Towards Mastery. By purchasing, you have a license to use the material but you do not own the material. You may not upload any portion of this resource to the internet in any format, including school/personal websites or network drives unless the site is password protected and can only be accessed by students, not other teachers or anyone else on the internet.